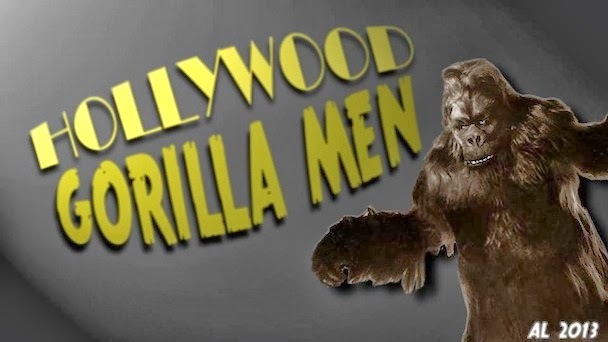 Hollywood Gorilla Men: Gorillas In Space! One of the fun coincidences among gorilla men is the fact, that by virtue of their skill with "Body English", they are also sought after to bring life to a variety of fantastic creatures ! 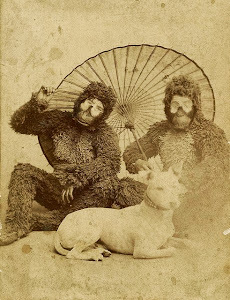 Many of the gorilla greats of bygone days, have ventured not only to other Earthly animals, but extraterrestial ones as well! This is me as the Solopticus in "Ghost of Garganta". This is the digitally animated still from "The Amazing Colossal Woman". Here is Bill Blacks winning entry as he appeared in the pages of Famous Monsters of Filmland. Through the efforts of my furry co-horts, we've been menaced by robots, horny gorillas , popcorn munching elephantine aliens, martians, and wiggly, rubbery, monster menaces of every description. 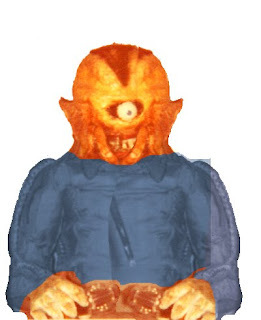 To get the ball rolling, I'll delve into a monstrous monkey man I know like the back of my hand, yours truly,The Mighty Bongo, AKA, Chris Casteel. 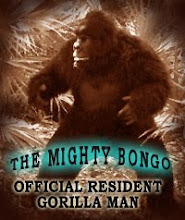 I've played Gorillas , in the films of micro budget filmmaker Bill Black for several years. 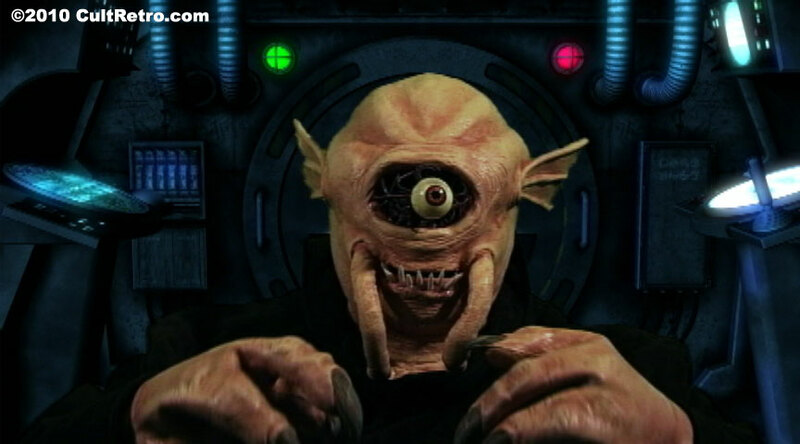 Through our working relationship, Bill became aware of my skill as a special effects guy and creature designer. As such, Bill pressed me into service for his epic tribute to 50's drive in classics, " Ghost of Garganta", a follow up to his "Amazing Colossal Woman" starring 6' beauty, Brenna Barry. My first task was to construct a 1/9th scale model ( from scratch) of a milk tanker truck, that the 60' tall giantess would pick up and drink from. Bill also tasked me to create a ghostly make-up on Brenna, for her first appearance as a ghost. After the day's shooting Bill asked if I would take a look at a photo of a creature he had created at 16 years old for a contest Famous Monsters magazine had sponsored. Bill was one of the 10 finalists in the contest with his one eyed creation, the Solopticus ! 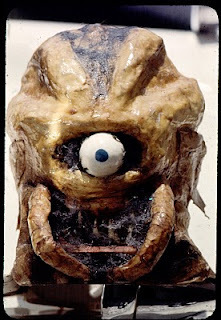 As a finalist, Bill had photos of himself,and his creation published in Famous Monsters #18( July1962 issue). He also was the winner of a whopping $10 dollar prize ! The poor Solopticus had deteriorated many years ago and was gone forever save the photos Bill had taken. Bill used stills of the Solopticus in the Amazing Colossal Woman with digital manipulation to provide motion to it, but now wanted to improve it by having a new head made using professional techniques. I sculpted the new head on on a life cast of myself, and when completed the beastie had not only a mouth that could move, but a fully functional cable controlled single eye! After filming, I did a recording session to give voice to this vile invader from the stars ! So having played this space menace, I get to join the ranks of all the gorilla guys who got to invade the Earth. 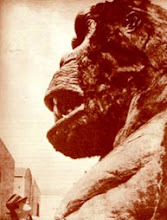 Ghost of Garganta, Amazing Colossal Woman, and all the Nyoka films I've been in as Satan the gorilla ( plus a whole lot more !) can be purchased at cultretro.com. Tell 'em Bongo sent ya !